Generally the newer a module is, the harder the campaign is. So as a fresh level 70, you might not be able to progress all the way on the newer campaigns. 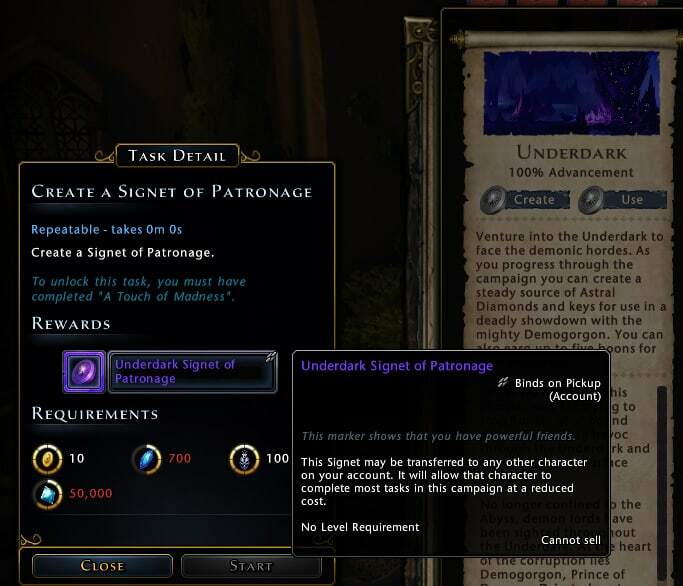 If you need are finding a campaign too hard, check out our Gearing Guide for Neverwinter, to upgrade your character first. Start doing as many of the campaigns as you can, since you can only progress a little bit every day or week on most of them. Do your daily and weekly quests and come back the next day or week. In the sections below we will go over each campaign in detail. First things first, there are a few ways to make campaigns go faster, or even complete instantly. These will complete campaigns instanly. They can be bought on the auction house or in the zen store. In the zen store you can buy the full Campaign Buyout Bundle for 10000 zen, or individual campaigns for 2000. The Cloaked Ascendancy costs 3000. Chult, Omu and Ravenloft are not yet available. Be sure to use your discount vouchers from invoking on these. On the auction house prices start at around 400k AD on PC. This is actually a great deal and I recommend that if you want to complete campaigns fast, that you buy these instead of doing the campaigns. Campaigns takes weeks to finish, and are a lot of work. If you use our Astral Diamond Guide, you can make enough AD in a day to buy a completion booster, saving yourself weeks of grinding, and you can spend your time on more important tasks. 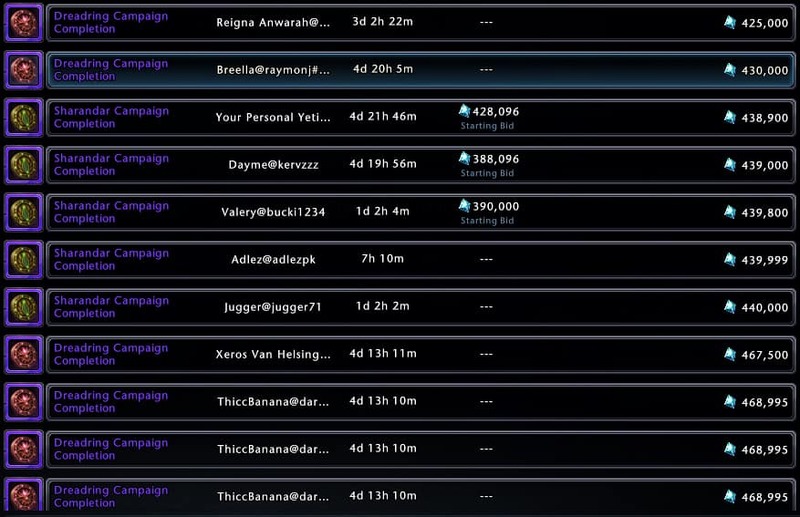 Buying campaign completion boosts saves a lot of time. When you have already completed a campaign on a character, you can make Signets of Patronage. These items can be given to you other characters and when used will reduce the costs for completing campaigns. To make or use a signet, open up the campaign window for the campaign you want to do, and click the Create or Use button in the upper left corner. These signets costs some 50k AD and some campaign currencies, that can be farmed pretty quickly. Signets of Patronage combined with Genie’s Gifts and / or 2 x campaign currency events, will allow you to finish off some campaigns really quickly. Signet of Patronage lets you finish campaigns quicker. 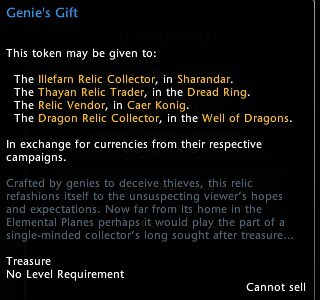 Genie’s Gift is an item that can be found in lockboxes or bought on the auction house, and turned in for Sharandar, Dread Ring, Icewind Dale, Tyranny of Dragons or Storm King’s Thunder campaign items. They are not too expensive so if you want a quick boost in either of those campaigns, buying a few is not a bad idea. The in-game description of Genie’s Gift does not list Storm King’s Thunder, but they can be used at Dereth Hope in Bryn Shanderor just by opening the SKT store in the campaign window. The best campaigns to spend Genie’s Gifts on is Dread Ring, as the whole campaign can be finished using them and Tyranny of Dragons. Combining Genie’s Gifts with a Signet of Patronage can be a quick way to advance a campaign. Check the prices of these compared to the Genie’s Gift. At the moment on PC only the Reghed Barbarian Fragment is cheaper than a Genie’s Gift. Every once in a while you will see in your in-game calendar that there are events for 2 x campaign currencies for a few of the older modules like Sharandar, Dread Ring, Icewind Dale, Underdark and Tyranny of Dragons. When you see these events coming by, be sure not to do your weekly quests early in the week. Save all the weeklies for the weekend or else you won’t get double currencies for the week. You can go ahead and do the dailies every day as usual. Also remember that the event lasts a bit into the next week so you can do the weeklies again on monday, giving you currencies from weeklies amounting to 4 weeks of work in just a few days. Combine this with a Signet of Patronage and you will finish a campaign very quickly on alts. In general you should work on as many campaigns at the same time as you can. You can start working on The Maze Enigne and Elemental Evil at level 60 and Sharandar at level 64. If you are powerleveling your character, level 60 to 70 takes no time at all, so there isn’t really a point to starting these before level 70. But if this is your first character in Neverwinter, leveling takes a bit more time, so you can start these campaigns and level at the same time. At level 70, start doing all possible campaigns for maximum efficiency. Begin with Ravenloft as the into quest is very easy and will give you a full set of gear at the end. The Maze Engine and Underdark is very fast and easy to work at while doing other campaigns. Some campaigns might be a bit hard depending on your gear and item level, so you can either choose to wait a bit until you improve your character a bit or you can try to find fellow players to help you for most of it. Joining a helpful guild is one of the best ways to find people that can help you with quests. The Maze Engine can be started at level 60, and is pretty straight forward. Do a series of quests from Bruenor Battlehammer in Mantol-Derith. When you have finished a few, you need to complete dailies to unlock the next few. Come back every day and do the available quests. Tales of Adventure: Used to advance the campaign, can only be gained from quests from Bruenor. Alliance Supplies: Used only for apperance items, also from quests from Bruenor. This one can be started at level 60 as well. There’s really no trick to this one, just start the quests from Archdruid Morningdawn, and work your way through the quests and zones. Unlike other campaigns, there are no cooldowns in Elemental Evil, so you could do it all in one go and be finished with it if you wanted to. Sharandar can be startet at level 64, so at level 70 it should be pretty easy and quick. The thing that will possibly hold you back and take time in Sharandar, is the Feywild Sparks, so buying Genie’s Gifts for addtional Feywild Sparks will speed things up. Unlock the main advancment tasks, then the boons in Sharandar, before eventually getting the key, although the key isn’t really needed for anything anymore. The Item Reward tasks should be skipped entirely. Gold Crescent: You won’t be short of Gold Crescents, as they are rewards from pretty much everything in Sharandar. But if you need more you can buy them with Fomorian Concoctions from the Bounty Master. Vibrant Seedling: Are gotten from daily quests in the first area, Blighted Grove. Abjuring Charm: From dailies in the second area, Dark Fey Enclave. Iliyanbruen Blades: From dailies in the third area, Realm of Malabog. Fomorian Concoction: Drops from any mob in Sharandar, can also be purchesed but has little value. Underdark is a super easy campaign to complete. You will get everything you need while doing Dread Ring, Tyranny of Dragons and Icewind Dale. Do the Demon Hunting quests in these zones from the Demon Hunter, and you will advance in both Underdark from doing the actual Heroic Encounter and in the other campaigns from the quest rewards. Faerzress: These are farmed in the Demonic Heroic Encounters. There are three different HE’s in each zone, the Demonic Encounter is the fastest one, and players will usually post in the chat if one is up. Farming Demogorgon, Epic Demogorgon and Underdark skirmishes will yield even more Faerzress, and nowadays even the epic demo only takes about 3 minutes. Demonic Ichor: Is also dropped in Demogorgon and skirmishes, but is pretty much useless except for maybe the Drowcraft shirt and pants for new chars. Twisted Ichor: From Epic Demogorgon which is now easy to farm but the weapons you can buy with these are now useless. Dread Ring can be done just by using Genie’s Gifts, but check the Auction House first as buying the Dread Ring Completion token is propably cheaper than buying Genie’s Gifts. The boon tasks in Dread Ring are pretty easy and quick. The Gauntlet tasks are adds a bit of work, but can be skipped. The gauntlets aren’t really necessary but can be used to make a bit of extra AD or refinement per day. The main quests you should pay attention to is the daily lair quest from Sergeant Knox and the Demon Hunting Quest from the Demon Hunter. Thayan Cipher: The most important of the Dread Ring items. You can get two per day, one from the lair quest and one from the demon hunting quest. Thayan Scroll: Can only be aquired from the Bag of Thayan Treassure at the end of the lairs, and from the weekly quest “The Red Wizards” from Knox. If you want more you need to use Genie’s Gifts. Vanguard Scrip: From all of the quests in Dread Ring. Some quests only award you with Vanguard Scrips, and can be skipped, unless you need a lot. The Bounty Master will also trade Onyx Fragments, which drop a lot or can be bought cheap on the AH, for Vanguard Scrips. Onyx Fragment: Can drop from any mob in Dread Ring. Seal of the Shadowmantel: Is from the Valindra’s Tower dungeon, but is pretty much useless. Tyranny of Dragons can be a bit grindy if you are not using a Signet of Patronage or Genie’s Gifts. The boon tasks are however seperate from the rest of the tasks, and I recommend you skip all other tasks as the rewards are very outdated and there is nothing you need for endgame there. There are quite a few different currencies for Tyranny of Dragons, many of them are not used for the boons. The first five tasks require common campaign currencies that you get from completing dailies and weeklies in Well of Dragons and from the Harpers in Protector’s Enclave. For the fourth and fifth one you will need “Haarl’s Treatise on Dragonkind” and “Breyer’s Draconic Investigations”, which is dropped in the Shores of Tuern skirmish but can be bought on the AH as well for nearly nothing. The sixth and seventh boon will also require “Linu’s Favor” and “Incantations of the Dragon Queen” which is dropped by Tiamat or bought on the AH. Linu’s Favor: The were once hard to come by but can be farmed quickly and easily now. You can either do the “Rewards for the Hoard” quest by clicking the wagon in the Well of Dragons camp. You can farm the items for the quest yourself but buying “Dragon Hoard Coffers” on the auction house is a much faster and pretty cheap way of completing the quest and getting “Linu’s Favor”. Additionally farm Tiamat now, which no longer has a entry timer and most groups can kill him in about 5 minutes. Dragon Hoard Coffer: These are random drops in Well of Dragons or rewards from Heroic Encounters. The easiest way to farm Dragon Hoard Coffers and Coins is to run Dragon Herald Heroic Encounters that start a quarter to every hour in Well of Dragons. Dragon Hoard Coins: These are pretty easy to come by. Drop from almost any Tyranny of Dragons content and reward from most quests. Drops a lot from Dragon Heralds. Page of Arcane Lore: From weekly quests from Elminster in Well of Dragons and from the Various Harper’s in Protector’s Enclave. Only around 45 Pages of Arcane Lore can be gotten each week if you do all the dailies and weeklies, so it might take less time to farm AD and buy Genie’s Gifts. Cult Secret: From various quests in Well of Dragons. Don’t need many for the boons. Fallen Dragon Fang: From quests in Well of Dragons, not needed for the boons. Dragon Sigil: Yet another one that you don’t need for the boons. Can be farmed through quests. To unlock Icewind Dale tasks, you have to first complete a short series of quests from Alden Lowell in Caer-Konig. Reghed Barbarian Relics are usually pretty cheap on the AH and works the same way as a Genie’s Gift, but neither of them will award you with reputation needed for the boons, only with the items needed. So even with Relics or Genie’s Gifts you will need to do “Safe Keeping” from Ten Towns or “Needless Distractions” for Arcane Brotherhood and / or “Icewind Dale: Demon Hunting” from the Demon Hunter. Each one awarding 10 reputation for a daily totalt of 20. You need a total of 350 reputation so completion will only take about 18 days. Only the first Baerick’s Iceforge task is necessary to unlock as the rest offer rewards that are useless now. After that you want to unlock Dwarven Valley as soon as possible, before starting the boons. Auril’s Tear: From Icewind Pass repeatable quests. Raw Black Ice: Pretty much useless now but can be farmed by mining nodes around Icewind Pass and Dwarven Valley, espesically in the PvP area. Is also rewarded from quests and can be farmed easily in Kessel’s Retreat. Storm King’s Thunder is by far the worst campaign to complete. You can use Genie’s Gifts here but they are not of much use and you will need to buy a lot of them or still farm a lot, making them pretty useless here. Buying a Storm King’s Thunder Completion token is strongly advised, as farming the AD needed for it will take a fraction of the time to finish the campaign the normal way. If you use our Astral Diamond Guide you can farm enough AD in just a few days. If you still want to complete it the old fashion way, unlock all the four areas before starting to work on any of the boons. You will also want to unlock Fangbreaker Island and Svardborg. All the other tasks should be skipped. Now you just need to start working on those dailies and weeklies in all the zones and farm a ton of Voninblod. The whole campaign takes about 2 months to complete. Voninblod: Reward from quests and Heroic Encounters, but the best way to farm is to farm Ostorian Relics. You will need a lot of these. Any SKT zone works equally well for this. Having a better Trowel grant better rewards, but getting the Zen Store Trowel is not worth it, get the one from the SKT store. Excavator’s Potion of Everfrost Resist and Remorhaz will also increase your gain. Ten-Towns Supplies: Quest reward from Bryn Shander, Lonelywood and Cold Run. Secrets of Ostoria: Quest reward from Bryn Shander, Lonelywood and Cold Run. Runic Pieces: From dailies and weeklies in Sea of Moving Ice. The Cloaked Ascendancy isn’t hard, but in turn it is really slow. It takes a long time to finish, but all you have to do each day are two short quests and a weekly every week. “A Weekly Ritual” from Kavatos Stormeye is your only weekly in the campaign. You will have the option to do three different instances, personally I think the Gyrion is the easiest and fastest after you get the jump sequence down. If you can’t do the ritual on you own, there are almost always group forming to complete the different rituals. You have to complete each once, then you can pick whichever you like after that. The daily is called “Mercantile Missions” and you will need to complete one other quest of your choice to complete “Mercantile Missions”. The easiest and fastest one is “Secure the Area” as you can quickly finish it while doing the Far Realm Ritual Heroic Encounters, which is the fastest way to complete “Mercantile Missions”. There are almost always groups running Heroic Encounters in the River District. The bottom line of tasks can be skipped completely. Evidence of Evil: 25 daily from “Mercantile Missions” and 20 from the “A Weekly Ritual” Quest. Abandoned Treasures: Very easily obtained from Heroic Encounters and from the weekly dungeons. Various other items for weapon restoration can also be acquired here but the weapons are now outdated. The big difference between Chult and previous mods, is that the campaigns can be completed at any time during the week. You can do it all on Monday if you like or you can spread it out. Doing everything doesn’t take very long either, but the mobs here are a bit thougher so you might need to gear up before starting here. (See our Gearing Up Guide for tips.) These zones are usually pretty populated with other people doing the quests so a lot of the hard ones like “House of the Crocodile” and “Fane of the Night Serpent” usually has folks that are also looking to complete it and will actively put groups together through the zone chat. The fastest way to unlock all of Chult and Omu is to do all available quests from Celeste, Wakanga O’tamu and Ekene-Afa, as well as the quests from the camps in Soshenstar River and Lost City of Omu, until you have reached the full weekly haul. Most of the gear from hunts here is now outdated so you can go ahead and skip unlocking the hunts if you want, which will save you a lot of time. Forgotten Totems: From Quests from Celeste and Wakanga O’tamu and in Soshenstar River. Lost Idols: From Quests from Celeste and Wakanga O’tamu and in Lost City of Omu. Chultan Riches: From all content that is in Soshenstar. You will easily gain these, but all items you can purchase with them are outdated. Omuan Treasures: From all quests in Omu. Only good for buying the Primal Paints. Eku’s and Makos’ Favor: From “Lich Lore” that drops of Thayans in Omu, or from “Bundle of Lich Lore” from The Tyrant Heroic Encounter. Useful for items like the Ring of Offensive Action. Soulmonger Ampoule: From Cradle of the Death God. Only 1 per week. Used to exalt your weapons. Ravenloft is very easy to start, but a bit harder to complete. Any character should be able to do the intro quest as the only fight in the quest can be left to the NPC’s. For new characters you will also get a chest with a full set of gear, which will come in handy. Like Chult and Omu, Ravenloft has only a weekly cap and you can finish the entire weeks worth of progress at any time during the week. After the intro quest, things get thougher, and you will need a pretty high item level to progress much farther solo. You can however find groups that are doing the quests making it possible for newer character to progress. You need to complete all the tasks in the campaign but they are pretty quick once you get going and completing the whole campaign only takes a few weeks. Barovian Coins: From quests, heroic encounters and hunts. These are really easy to come by, but if you need to farm them for gear, doing hunts with Tarokka Cards active is propably the fastest way. Omens: From daily and weekly quests. Tarokka Cards: From weekly quests and rarely as drops. Wanted Posters: 1 star drop from mobs and 2 and 3 star from 1 star bosses. The Acquisitions Incorporated campaign can be started at level 15, and more is unlocked as you level up. You start the campaign by clicking one of the posters around PE, then doing a short quest in Blacklake District. The rest of the campaign is centered around the AI headquarters in PE. Just speak to Omin Dran and Jim Darkmagic and do the quests you are given to fill up your weekly haul. All in all this is a pretty easy campaign to complete. Wooden Tokens: From the same quests. My general advise is to at least consider buying Campaign Completion packs for at least some of the mods, as farming AD can be a lot faster than doing the dailies and weeklies for weeks and months. The list below is how I would go about completing all the campaigns in the fastest way possible, without completion tokens. For alts, use Signet of Patronage when you can. Possibly along with a 2x event. For new players, start doing Acquisitions Incorporated at level 15. The Maze Engine, Elemental Evil and Sharandar at level 60 and 64. At level 70 start Dread Ring and Underdark, as well as the intro for Ravenloft for the gear (you can progress in Ravenloft as well but if you are undergeared you need a group). When you get a bit of boons and gear, start Tyranny of Dragons, consider using Genie’s Gift to speed it up. Begin The Cloaked Ascendancy. The dailies should be fine as long as you can finish the intro quest. Get a group for the weeklies if you need one. Start doing Icewind Dale. Consider Genie’s Gifts or Reghed Barbarian Relics here also to speed things up. Strongly consider buying the Storm King’s Thunder completion, or prepare for a long grind. For SKT, a single piece of Frostborn armor (from a Frostborn * Pack) significantly improves relic digging results.